I've always said it is about the journey, not the destination, and this is certainly true for my experience on Mount Rainier! As you all probably know by now, J successfully summited, along with Fire Marshall Mac. In J's words, it was the most difficult outdoor recreation thing he ever attempted--even frightening at times--but he was so rewarded by it and wants to go back for more!!! Fire Marshall Mac, on the other hand, said that will be the last of his mountaineering experiences. 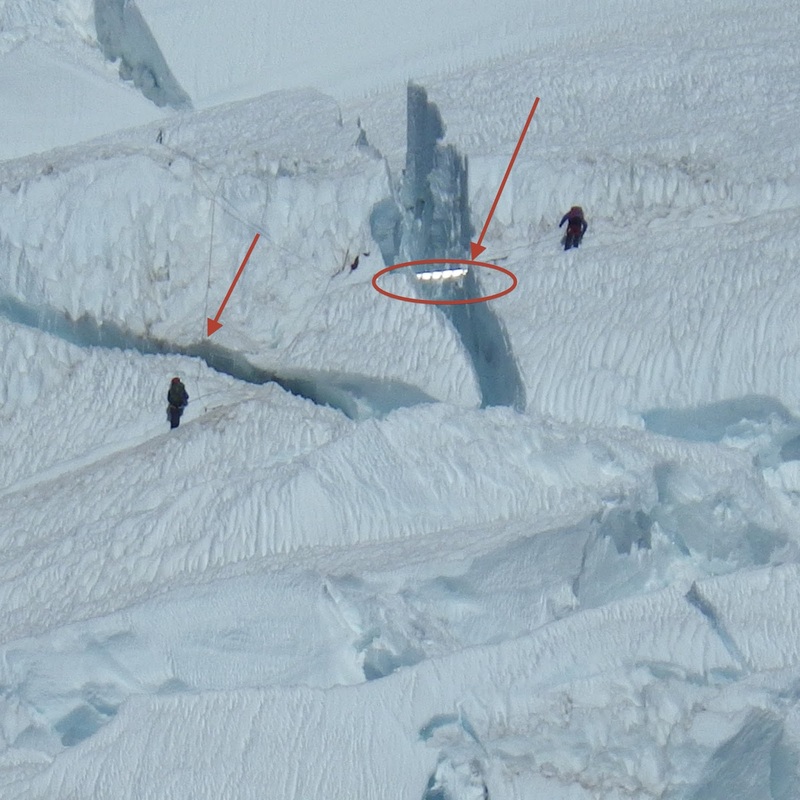 I've highlighted the ladder J & Mac had to traverse over a crevasse. As for me, I realized how big of a difference there was between hiking and mountaineering. I do NOT belong in the mountaineer category. The first reason is it is freakin hard work. The climb happens in 2 parts. 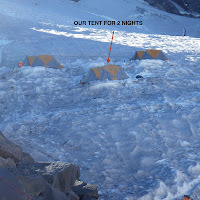 First, you hike roughly 4 miles/4,000 feet from the Paradise parking lot to Camp Muir at 10,060. Then you climb another 4-5 miles/4,000 feet over Cowlitz Glacier to Cathedral Gap and Ingraham Flats to the summit at 14,410 feet. I remember reading that and thinking, I've hiked 4 miles with that kind of elevation change. Easy peasy!!! Boy was I wrong. There really is no frame of reference for the hike. I forgot to account for the fact that I would have a 50 lb backpack on my back (my pack usually weighs 20-30 lbs). I forgot I would be wearing mountaineering boots (3 lbs each) and sometimes crampons on my feet, taking more energy for me to lift my feet. I forgot that we would be traveling 90 percent on snowfields and glaciers, which requires very deliberate steps. Still, the rocky parts were quite possibly the worst. If you think hiking on jagged rocks is hard, try doing it with crampons on! 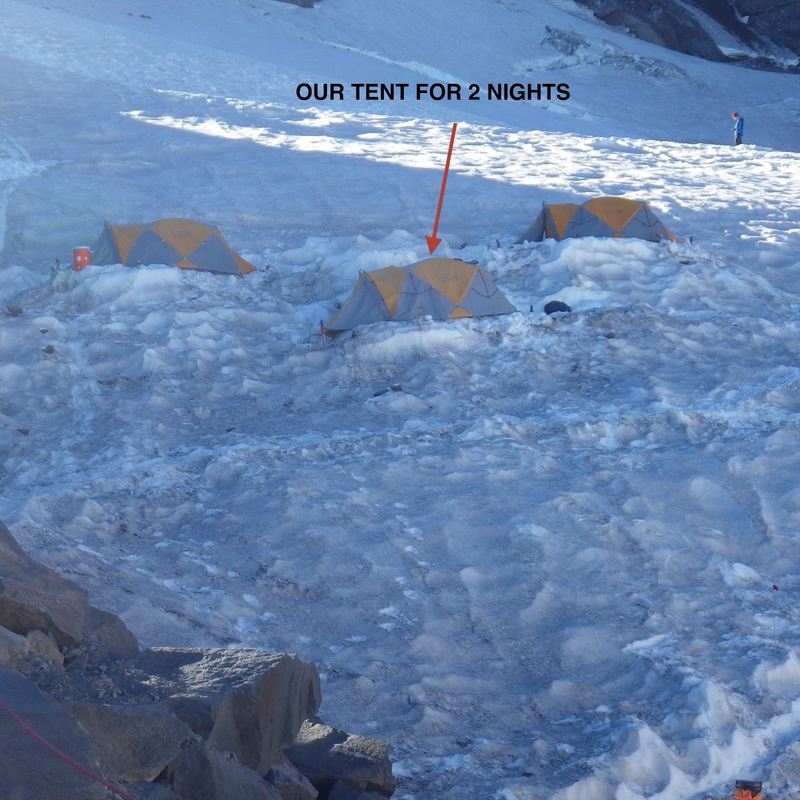 Not to mention stepping over and around crevasses … As a result of all these factors, each mile took at least an hour. Also, the hike must be timed perfectly. 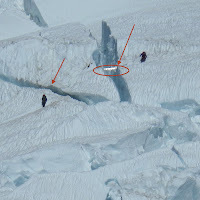 There is really a short window when you want to climb on the highest part of the glacier, which is why you get up at midnight to attempt the final leg of the summit. So the guide service has this whole schedule for us. We hike for an hour, then break. Hike for an hour, break. I totally get it. If we stopped every time someone wanted to take a break, we would never get anywhere. But, I love my breaks when I am hiking. I love drinking water. I love going at my pace. I burned a lot of energy even in the first few miles just by trying to keep up and skipping my desired breaks. Admittedly, my training was certainly not where it needed to be. It is not like I went from couch to mountain, but I should have taken the whole message of "plan on being in the best shape of your life" more seriously. For this reason, I was not a happy hiker. It pained me to smile in this picture taken when we got to Camp Muir, and it's more like a half smile. Lastly, the sun was BRUTAL. With snow, it doesn't just beat down from above you, but it reflects up. Who knew you should apply sunscreen inside your nostrils? The bottom line is I just couldn't hack it. The completion rate is about 50% and out of our 9 people in our group, 5 summited. Still, I learned a ton of skills and there were great parts, like feeling like you were on top of the world. I can now say it was all worth it, despite my grumbling, but I will stick to backpacking!